Indoor electric grills are nothing new; George Foreman grills have been around for over 20 years now, providing healthy, smokeless grilling options for indoor use. Yet as nifty and fun as George Foreman grills are, indoor grills have never been considered a hot item for passionate and avid home cooks. 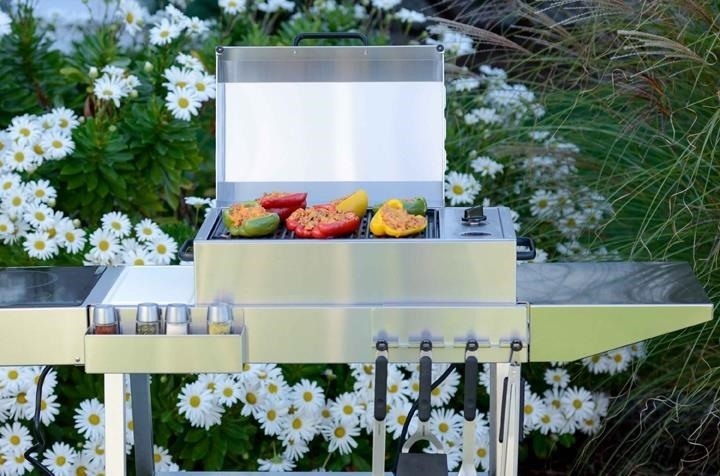 That's changing with the indoor City Grill by Kenyon, which is designed not to be a healthy replacement for a grill, but an urban culinary toy for those who love the process of grilling. And for apartment-dwellers like myself, it's a dream come true. While the George Foreman line (and many of its competitors) is designed to increase health and decrease effort, the Kenyon model focuses on the two critical Fs of cooking: flavor and fun. Whereas the George Foreman grill is designed at a slant to eliminate fat (great for health ... not so much for flavor), the Kenyon model lies flat, with a tray underneath the electric coils to catch any fat drippings, so they can be reused (you can also flavor the drip tray to infuse your meats. 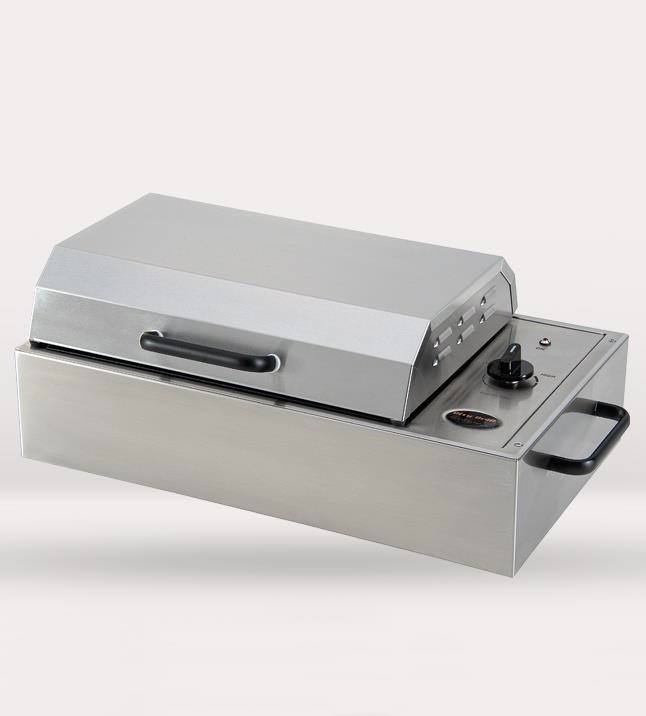 The City Grill also has a wider array of settings, which allows for more control in cooking. My favorite is the sear feature, which pumps the coils up over 500° F for as long as you'd like (the Foreman grill has a timed sear feature, designed to take the cook's judgment out of the equation). The biggest plus of the City Grill is that it is almost entirely smokeless, and, being all-electric, devoid of flame-ups. The City Grill was designed for ... well ... the city: it's compact enough to be an apartment toy (but still big enough for six burgers), it's sleek enough to look like an awesome modern amenity, and it won't send your smoke alarm blaring. 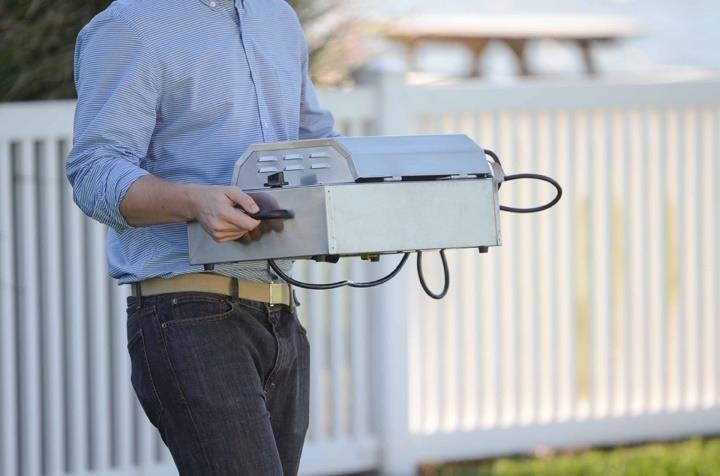 It's also remarkably easy to clean and can pair with a rolling cart accessory to be the ultimate outdoor grill, too. And it plugs directly into a standard outlet. And if you happen to be one of those lucky souls who own a boat (or has access to a great outdoor area), this grill is perfect for you. 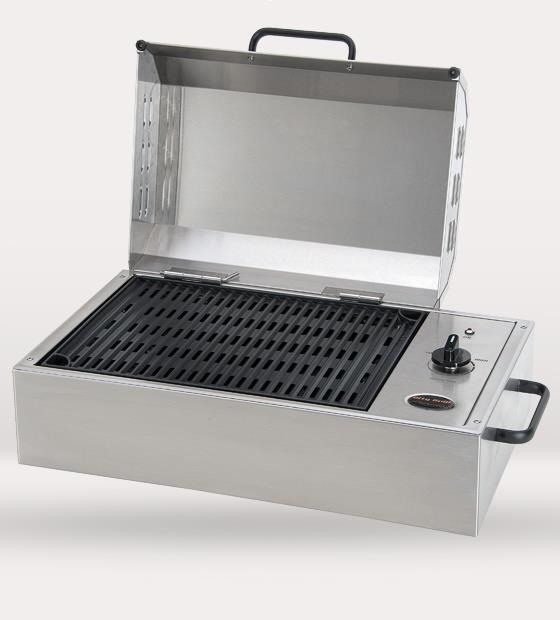 The City Grill uses marine-grade stainless steel, which makes it truly all-weather and weatherproof. 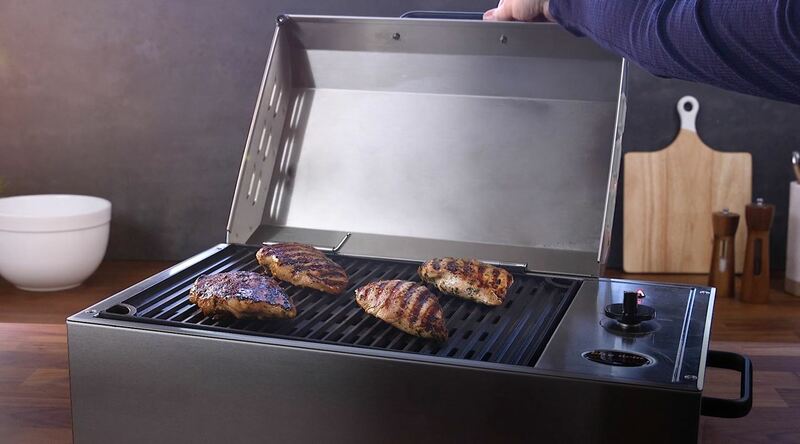 In reality, this toy is as much an outdoor grill as it is an indoor one. There is one downside: the cost ($427.50 before shipping), though it's much cheaper than their Floridian and Frontier grills. But this is emphatically a case of getting what you pay for; the Kenyon City Grill is a lot more expensive than a George Foreman Grill, but quite frankly, it's a lot better. And if you want to turn your apartment into a swanky culinary paradise, I can think of no cooler toy.